Airplanes are notorious for being giant flying petri dishes. The rush to turn flights around in mere moments, day in and day out, makes them akin to a bath towel you always air-dry but never wash. The FAA has nothing to say about how often and how thoroughly planes are cleaned, so the airlines are in charge. Guess where that leaves you. When Skytrax rated the 20 cleanest airlines in the world this year, EVA Airways was tops, but no US carriers made the list. But how dirty is dirty, exactly? 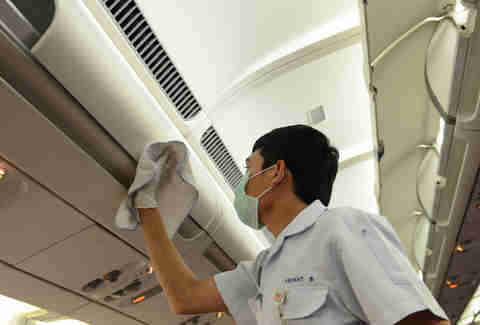 How deeply your plane is cleaned depends on how long the turn is. A “turn,” in airline jargon, is how long the plane sits on the ground between flights. For quick domestic trips like shuttles from Dallas to San Antonio, this can be as little as 30 minutes. Cleaning crews remove obvious trash, wipe crumbs off seats, buff the lavatories and galleys, and restock supplies. This is why you sometimes find used wrappers or the last passenger’s boarding pass in your seatback pocket. For longer turns, crews have time to empty out the seatback pockets and vacuum the floors. Generally that’s about the extent of the difference -- unless there was a major incident like a “service dog” mistaking the beverage cart for a fire hydrant. Sometimes the airline will delay a flight to get that mess properly cleaned. 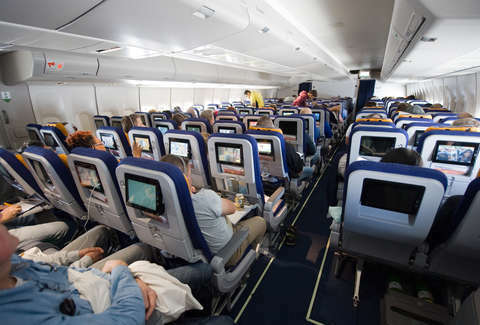 But your seats, tray tables, and armrests are still crawling with whatever bacteria is left from the previous flights. The cleanest seats go to those who upgrade. Delta and United told The Wall Street Journal they cleaned all first and business class tray tables and windows with sanitary wipes between flights. So, rich folks, breathe easy. 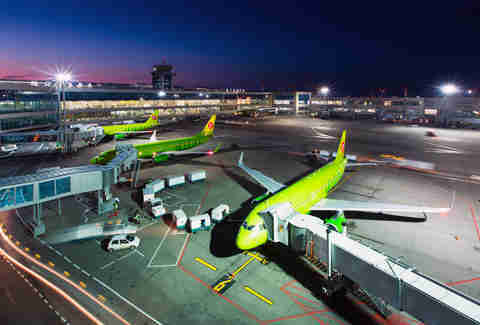 Airlines do a more thorough scrub-down when planes stay overnight at an airport. 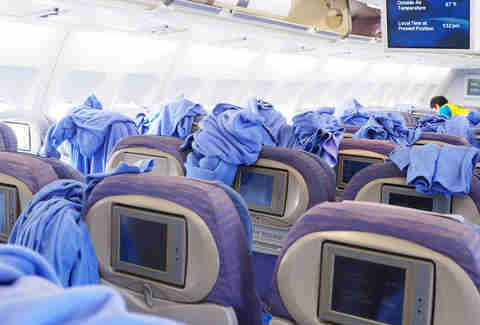 Crews wipe down the armrests and tray tables and in-flight entertainment screens, vacuum the floors, and clean out the seatback pockets. Galleys and lavatories are also thoroughly cleaned, waste is removed, and blankets and pillows are replaced. The plane is like the equivalent of when you clean up for company, but not right after the maid’s been there. So take heed, germaphobes: That 6am departure is your best bet for a clean flight. During the height of the airlines’ dark days in the years right after 9/11, Delta reported it only gave its planes a thorough cleaning once every 15 to 18 months. But after years of complaints, the industry has gotten a little better. Singapore Airlines -- the ninth-cleanest airline in the world according to Skytrax -- gives its planes a hearty scrub down every 30 days. In that same Journal story, United reported deep-cleaning every 35 to 55 days and American every 30 days. Per World Health Organization guidelines, planes returning from areas prone to viral outbreaks, like West Africa for example, are also deep cleaned upon their return. In a deep cleaning, the ceiling, walls, and overhead bins are sanitized, the floor is shampooed, and ripped seats are replaced. Cloth seats are also shampooed and synthetic ones are sanitized. It’s basically as close to a new plane as you’re ever going to fly in. Given that you could be on a plane that has gone three months without being disinfected, you may want to take matters into your own hands. Travel with a pack of sanitary wipes -- as flight attendants were doing in their Ebola kits during the height of that scare -- and wipe down your seat, armrest, and tray table as soon as you take your seat. Use a tissue when you touch the toilet and door handles in the lavatory, and bring alcohol-based hand sanitizer with you in a TSA-approved size. Then, as Neil Patrick Harris advised, put some Neosporin around your nostrils to strain out the bacteria you breathe in. Flying is a dirty business, and though it might stand to reason that airplanes should be deep cleaned more often than your car, the economic reality dictates otherwise. So pack along some sani-wipes, wipe down the IFE remote, then plug in your own headphones as you try not to think too hard about where else your armrest has been. Matt Meltzer is a contributing writer to Thrillist who credits exposure to airplane germs at an early age for his kickass immune system. Get more parenting tips on his Instagram @meltrez1.